No specific restrictions, you are all welcome! Please advice your arrival time. Riad Sijane has been created by two developers of luxury accommodation in Marrakech who were looking for a challenge. We wanted to create an economical and socially responsible property. 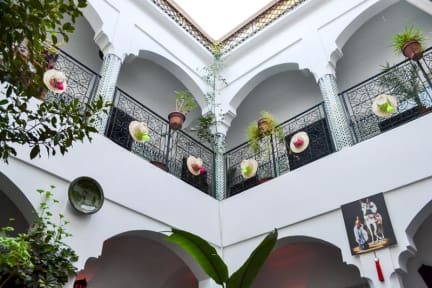 Riad is more than just a simple accommodation for travelers; it is a place of experimentation into sustainable development, as well as a place for artists and culture to experience . 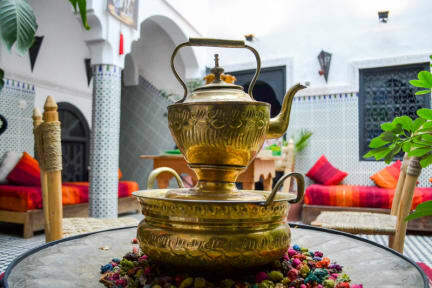 Riad Sijane is a Riad traditional house located less than 6 minutes walk (500M) from the mythical place that is Jamaa El Fnaa Square, making it easily accessible for all. Most of the monuments and other tourist hotspots in the city are within walking distance from the Riad Sijane. The property is composed of 3 dormitories & 2 Private Rooms , a patio and a sublime terrace with stunning views of Koutoubia mosque and the roofs of the medina. Riad Sijane offers a homemade breakfast. We offer excursions to the Atlas mountains, Sahara Desert and the beautiful coast of morocco, with departures guaranteed everyday and discounts given depending on the size of the group. We make our guests the delicious traditional dishes that morocco is famous for and light vegetarian food at a very good price. The terrace boasts a smoothie bar where we offer our travelers a wide range of smoothies and juices. Here you can enjoy the never ending magic of Marrakech. We also offer a number of different activities to keep you busy, including cooking lessons and arts & crafts workshops. Taxes not included - Local occupancy tax 2 euros per person per night. Excelente albergue. Relación precio-calidad perfecta, buena limpieza y excelente atención.